باقری, زهرا, پورابراهیم, شراره, کابلی, محمد. (1397). ارزیابی سریع تهدیدهای تنوع زیستی در مجموعه حفاظتی جاجرود با استفاده از سامانه تصمیم گیری و GIS. فصلنامه محیط زیست جانوری, 10(1), 41-46. زهرا باقری; شراره پورابراهیم; محمد کابلی. "ارزیابی سریع تهدیدهای تنوع زیستی در مجموعه حفاظتی جاجرود با استفاده از سامانه تصمیم گیری و GIS". 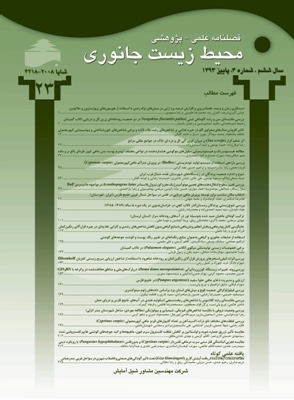 فصلنامه محیط زیست جانوری, 10, 1, 1397, 41-46. باقری, زهرا, پورابراهیم, شراره, کابلی, محمد. (1397). 'ارزیابی سریع تهدیدهای تنوع زیستی در مجموعه حفاظتی جاجرود با استفاده از سامانه تصمیم گیری و GIS', فصلنامه محیط زیست جانوری, 10(1), pp. 41-46. باقری, زهرا, پورابراهیم, شراره, کابلی, محمد. ارزیابی سریع تهدیدهای تنوع زیستی در مجموعه حفاظتی جاجرود با استفاده از سامانه تصمیم گیری و GIS. فصلنامه محیط زیست جانوری, 1397; 10(1): 41-46. امروزه تنوع زیستی در سرتاسر جهان، به ­ویژه درکشورهای درحال توسعه با تهدیدهای زیادی روبرو است. هدف اصلی این مطالعه، پهنه­ بندی وضعیت تهدید تنوع زیستی در قالب یک شبکه سلولی با یکی از روش ­های ارزیابی سریع است. برای ارزیابی سریع تهدیدهای تنوع زیستی در مجموعه حفاظتی جاجرود، ابتدا معیارها و زیرمعیارهای ارزیابی سریع تهدیدهای تنوع زیستی با مرور منابع مختلف شناسایی و سپس با استفاده از روش تاپسیس زیرمعیارهای با اهمیت ­تر انتخاب شدند. زیرمعیارهای انتخاب شده براساس شاخص­ های مربوطه کمی ­سازی و برای طبقه ­بندی وضعیت تهدید تنوع زیستی در منطقه مورد مطالعه استفاده شدند. در نهایت وضعیت تهدید تنوع زیستی در قالب یک شبکه سلولی در مجموعه حفاظت شده جاجرود در پنج طبقه بحرانی، تهدید زیاد یا درخطر، تهدید متوسط یا آسیب­ پذیر، تهدید کم و تهدید بسیارکم طبقه­ بندی شد. اصغرپور، م.ج.، 1383، تصمیم­ گیری ­های چندمعیاره، تهران، انتشارات دانشگاه تهران، 398صفحه. سازمان حفاظت محیط زیست.1391.بازنگری و بروزرسانی مطالعات تفصیلی مجموعه جاجرود (حفاظت شده و پارک ملی). معاونت محیط طبیعی، دفتر زیستگاه ­ها و امور مناطق.جلد شانزدهم، کتاب طرح، 115صفحه. Bagheri, Z.; Pourebrahim, Sh. and Kaboli, M., 2015. prioritizing biodiversity threats in Iran protected areas using TOPSIS method. J of Ecology and Environment. pp: 209-220. Baral, H.; Keenan, R.J.; Sharma, S.K. ; Stork, N.E. and Kasel,S.,2014.Spatial assessment and mapping of biodiversity and conservation priorities in a heavily modified and fragmented production landscape in north centeral Victoria, Australia, Ecological Indicators. Vol. 36, pp: 552-562. Burgess, N.D.; Hales, J.D. ; Riketts T.H. and Dinerstein, E., 2006. Factoring species, non species values and threats into biodiversity prioritization across the ecorgions of Africa and its islands. Biologi Conservation. Vol. 127, pp: 383-401. Connelly, J.W. ; Knick, S.T. ; Schroeder, M.A. and Stiver, S.J., 2004. Conservation assessment of Greater Sage grouse and sage brush habitats. Chapter 7, pp: 276-400. Ervin, J., 2003. Rapid Assessment of Protected Area Management Effectiveness in Four Countries. Bio Science. Vol. 53, pp: 833-841. Gardner, T.A. ; Barlow, J.; Sodhi, N.S. and Peres, C.A., 2010. Amulti regional assessment of tropical forest biodiversity in a human-modofied world, Biological Conservation. Vol. 143, pp: 2293-2300. Ibisch, P.L. ;Nowicki, C.; Gonzales, R.; Oberfrank, T.; Specht, C.; Araujo, N. and Minkowski, K., 1999. Identification of conservation priorities in the Bolivia Amazon Anew biological socioeconomic methodology using GIS, Deutscher Tropentage in Berlin. Ibisch, P.L. ; Nowicki, C.; Muller, R. and Araujo, N., 2002, Methods for the assessment of habitat and species conservation status in data poor countries-case study of Pleurothallidinae of the Andean rain forests of Bolivia. Congress of Conservation of Biodiveersity in The Andes and Amazon. pp: 255-246. Rouget, M.; Richardson, D.M. ; Cowling, R.M. ; Lloyd, J.W. and Lombard, A.T., 2003. Cuttent patterns of habitat transformation and future threats to biodiversity in terrestrial ecosystems of the Cape Floristic Region, South Africa. Biological Conservation. Vol.112, pp: 63-65. Rogres, H.M.; Glew, L.; Honzak, M. and Hudson, M.D.,2010, Prioritizing key biodiversity areas in Madagascar by including data on human pressure and ecosystem services. Journal of Landscape and Urbun planning. pp: 48-56. Shi, H.; Singh, A.; Kant, S.; Zhu, Z. and Waller, A.E., 2005, Integrating Habitat Status, Human Population Pressure and Protection Status inti Biodiversity Conservation Priority Setting, Conservation Biology. pp: 1273-1285. Thoisy, B.; Richard Hansen, C.; Goguillon, B.; Joubert, P.; Obstancias, J.; Winterton, P. and Brosse, S., 2010. Biodiversity Conservation. Vol. 19, pp: 1567-1589. Thorn, J.; Nijman, V.; Smith, D. and Nekaris, K.A., 2009. Ecological niche modeling as a technique for assessing threats and setting conservation priorities for Asian slow Lorise (Primates: Nycticebus), Diversity and Distributions, Vol.15, pp: 289-298.